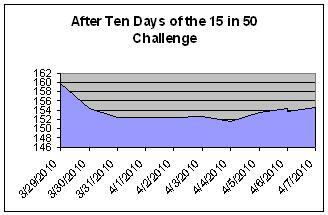 Down 5.2 Pounds in the First 10 Days of the 15 in 50 Challenge! My goal to take off 15 pounds in 50 days! Here is a look at my day-by-day weight loss after my first ten days. Salt and eating late gave me a slight set back. I’ve taken off 5.2 pounds, and I’m thrilled. My New Short Term Goal is to get the next five pounds off by the week of the 19th. This gives me just over ten days to get it done. Not to eat any “Ham” or high salt foods. No Garlic-Stuffed Green Olives (my favorites). To have consumed my dinner and snack by 7pm. To make a pitcher of water in the morning when I make my coffee and have it drank by mid afternoon. Here I go… I’m taking off the next five pounds and these have been with me for 40 years! I want them gone and can’t wait to see 149.5 on the scale. I’ll keep you posted so please check back and see my progress. This entry was posted in Joyce's Blog Notes and tagged 15 in 50 Day Challenge is Alive, down 5.2 pounds in my first 10 days. Bookmark the permalink.